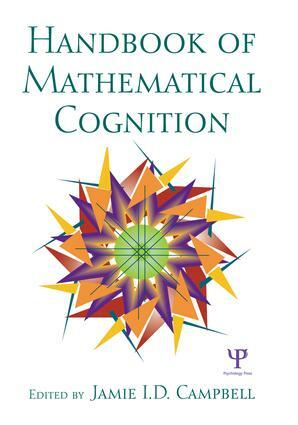 "The scientific investigation of mathematical cognition is a relatively recent enterprise. Compared with the interest and resources that have been invested in literacy skills, numerocity is a fledgling topic for scientific enquiry. Yet in a short space of time, our knowledge has grown rapidly. This exceptionally comprehensive handbook brings together all the diverse approaches to the field. These 27 essays are grouped into 5 sections that deal with number representations, cognitive procedures, development and learning of numerocity, and neuropsychology of number skills, both in youth and adults. Apart from such mainline research, the handbook is liberally spaced with diversions to more esoteric topics, such as the numerical abilities of pigeons. The editor is to be congratulated for his success in recruiting and coordinating such an authoritative group of contributors. "With recent advances in tracing cognitive processes and brain imaging, the structures of mathematical ability are now emerging in greater detail. In this handbook, the world's leading scientists describe their cutting-edge insights into the mental representations and skills that mediate mathematical calculation and estimation. Anyone interested in the nature of human development and skill acquisition should read this book. Part 1: Cognitive Representations for Number and Mathematics. M. Fayol, X. Seron, About Numerical Representations: Insights from Neuropsychological, Experimental and Developmental Studies. M. Brysbaert, Number Recognition in Different Formats. W. Fias, M.H. Fischer, Spatial Representation of Numbers. J. Tzelgov, D. Ganor-Stern, Automaticity in Processing Ordinal Information. M. Zorzi, I. Stoianov, C. Umiltà, Computational Modeling of Numerical Cognition. E.M. Brannon, What Animals Know about Numbers. R. Núñez, G. Lakoff, The Cognitive Foundations of Mathematics: The Role of Conceptual Metaphor. Part 2: Learning and Development of Numerical Skills. S. Cordes, R. Gelman, The Young Numerical Mind: When Does It Count? J. Bisanz, J.L. Sherman, C. Rasmussen, E. Ho, Development of Arithmetic Skills and Knowledge in Pre-school Children. K.F. Miller, M. Kelly, X. Zhou, Learning Mathematics in China and the United States: Cross-cultural Insights into the Nature and Course of Pre-school Mathematical Development. M.-P. Noël, L. Rousselle, C. Mussolin, Magnitude Representation in Children: Its Development and Dysfunction. R.S. Siegler, J.L. Booth, Development of Numerical Estimation: A Review. K.C. Fuson, D. Abrahamson, Understanding Ratio and Proportion as an Example of the Apprehending Zone and Conceptual-phase Problem-solving Models. T. Ben-Zeev, S. Duncan, C. Forbes, Stereotypes and Math Performance. Part 3: Learning and Performance Disabilities in Math and Number Processing. D.C. Geary, M.K. Hoard, Learning Disabilities in Arithmetic and Mathematics: Theoretical and Empirical Perspectives. M.M.M. Mazzocco, M. McCloskey, Math Performance in Girls with Turner or Fragile X Syndrome. M.A. Barnes, B. Smith-Chant, S.H. Landry, Number Processing in Neurodevelopmental Disorders: Spina Bifida Myelomeningocele. M.H. Ashcraft, K.S. Ridley, Math Anxiety and its Cognitive Consequences: A Tutorial Review. Part 4: Calculation and Cognition. N.J. Zbrodoff, G,D. Logan, What Everyone Finds: The Problem Size Effect. J.I.D. Campbell, L.J. Epp, Architectures for Arithmetic. J.-A. LeFevre, D. DeStefano, B. Coleman, T. Shanahan, Mathematical Cognition and Working Memory. J.A. Dixon, Mathematical Problem Solving: The Roles of Exemplar, Schema, and Relational Representations. S. Duverne, P. Lemaire, Aging and Mental Arithmetic. M. Pesenti, Calculation Abilities in Expert Calculators. Part 5: Neuropsychology of Number Processing and Calculation. S. Dehaene, M. Piazza, P. Pinel, L. Cohen, Three Parietal Circuits for Number Processing. B. Butterworth, Developmental Dyscalculia. A. Lochy, F. Domahs, M. Delazer, Rehabilitation of Acquired Calculation and Number Processing Disorders. Jamie I. D. Campbell is a Professor of Psychology at the University of Saskatchewan, Canada. He earned a B.A. in Psychology from Queen's University in Kingston and a Ph.D. from the University of Waterloo. He has published numerous scientific articles in the area of mathematical cognition and previously edited The Nature and Origins of Mathematical Skills in 1992.